One of my quilts was chosen for a McCalls magazine. On shelves now. The flat picture of it does not do it justice. You have to click on the link and see the styled shot. Maggi Honeyman worked her magic once again on the quilting! No matter how beautiful the fabrics or how intricate the piecing, it is the quilting that adds such texture and dimesion. Yummy! The quilt kind of looks like schools of fish swimming through the tropics. The moda retreat for shop owners is next week. I think I will hang this quilt on my office wall so I can show it off. Thanks McCalls for featuring little ol’ me. 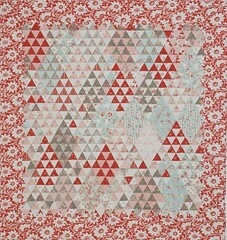 The quilt is gorgeous, but how can you go wrong w/MODA! And yes I can see the fish. BTW-I am a Moda Lisa twitter fan! Congratulations! I love the quilt and it's fish! Oh it's gorgeous! I love how the border softens the angles and i love how it flows. Congrats! Wow! What an honor, Lissa. And what a beautiful quilt. I was admiring it in my copy just earlier today! It is beautiful! Congratulations Lissa! It is absolutely gorgeous! Such a lovely quilt! Have fun at the retreat. It's absolutely beautiful…as are all of your quilts I've seen in magazines! Congratulations once again! Congratulations!! It is a beauty! Just beautiful. I can't wait to get my issue! Yes it is more beautiful styled in the magazine! LOVE the red! Congratulations! You must be so proud! The quilt looks lovely, and I must get my hands on an issue of the magazine right away. Just got my magazine and had to come back and say I love the styled shot…you really get more of a feel for the quilt from that photo…it's just gorgeous! congrats!! i love this quilt… and i have the perfect fat quarter bundle to make it out of! Beautiful Quilt! How do you do it all? Congrats!!! Lovely quilt- fabulous color scheme! !